Pavilion parking for 100 cars. Beach parking for 150 cars. Guarded swimming beach with concessions stand. Two playgrounds (near pavilion and beach areas). Two volleyball courts (near pavilion and beach areas). Play field with back stop. More than three miles of paved trails. 32 picnic tables throughout the park. 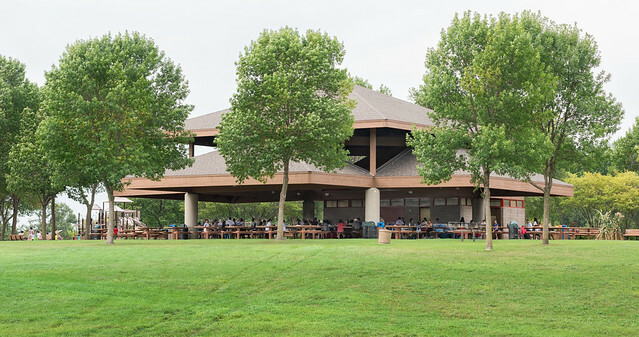 41 six-foot picnic tables under the pavilion. 13 tables with seating for four outside the pavilion. Pig roasting area (requires an additional fee). Kitchen including four-burner electric cooktop, two sinks, walk-in cooler, upright freezer and electrical outlets. Electrical outlets on pavilion exterior. Center serving island with electric outlets. Handicap-accessible flush toilets in adjacent beach building.